A huge, complex Gears-style romp through post-pandemic Washington that has staying power. At last there's an online, persistent game that feels fully formed at launch and has room to evolve too. 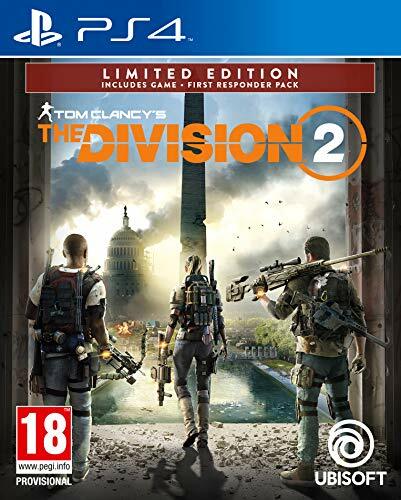 So-called games-as-a-service - of which The Division 2 is one - have often tended to find greater favour with their publishers than with gamers. Designed to take place in persistent universes, and thereby providing endless opportunities for those who play them to spend money on loot boxes, recent examples like Anthem and Battlefield V have been unleashed into the wild in a barely half-finished state. Happily, The Division 2 bucks the trend in a very impressive manner. Perhaps that's because it's the second instalment of the franchise - Destiny 2, the second instalment of the franchise that established the games-as-a-service blueprint was also markedly better than its predecessor. Like that game, The Division 2 stands up very well indeed in pure gameplay terms, even without considering all its online, persistent elements. The Division 2 is easy enough to describe: as a third-person cover-shooter (although you can enter first-person mode for sniping), it feels pleasingly similar to the Gears of War games. Mechanically, it is beautifully fettled: wherever you are in its huge game-world there are always countless cover options, and it has an exemplary mechanism for moving from cover to cover while keeping your head out of the line of fire. And you will have to move around, since excellent artificial intelligence (AI) dictates that enemies will always try to outflank you. It's a much more complex game than Gears of War, though, in common with its games-as-a-service peers, and much of that complexity feeds cleverly into its gameplay. You level-up as if you were playing a role-playing game (RPG) - which grants you ever-increasing health stats - and an excellent loot system, which is more or less identical to that of Destiny 2, brings a constant stream of new guns and armour components, most of which can be modded extensively. There's a perks system, too, although rather annoyingly you're likely to max it out long before hitting the magical level 30, which unlocks the end of the main storyline, followed by the endgame. But the most important element of the armoury that The Division 2 provides you with is the section entitled Skills. You can wield two of those at any time, and they range from the likes of drones and turrets that shoot enemies you designate, to a gas-deliverer which can create explosive clouds around enemies, among various shields and various delivery mechanisms that offer buffs and remote recovery to your allies. Skills operate for a finiter time and have cool-downs, so you must use them intelligently. The Division 2 makes an awful lot more sense when played with others - it has been set up for four player co-operation - and while you can work your way as a solo operator through all the story missions, side missions and the vast majority of the game's plethora of activities, you will progress much more quickly if you avail yourself of the game's excellent matchmaking system (you can, for example, fast-travel to a team-mate if they start a mission) or better still play through it with a bunch of mates. It doesn't really matter if the odd player drops out as The Division 2 scales its difficulty accordingly - but it is worth bearing in mind that it's definitely harder to play as a solo operator. It throws a lot of enemies at you, of escalating skills and abilities, with some that are essentially bosses, and, while it is checkpointed once you start a mission, it isn't when you're just engaging in freeplay. So if you die, you will have to respawn at the nearest safehouse or settlement. If you're expecting narrative thrust from The Division 2, prepare to be disappointed. It doesn't really have a coherent story - rather a premise which, admittedly, is a decent one. As in The Division, you're an agent of the Strategic Homeland Division, created to restore order after a national emergency - which was the release of a virus that killed off vast swathes of the population and left America's cities abandoned by ordinary citizens and overrun with military factions. In The Division 2, the action switches from New York to Washington and, once again, you're entering a city in complete meltdown and anarchy, and must pretty much restore a semblance of order single-handed. Luckily, there are pockets of sanity in the form of settlements - barricaded oases where ordinary people are trying to rebuild their lives. As you carry out story and side missions, you upgrade those, generating more manpower for the fight to restore order. Cutely, your main base of operations is the White House (in disarray at the start of the game, with the just-installed President missing, presumed dead after Air Force One was shot down). Many of the story and side-missions involving rescuing individuals who have been captured by the various enemy factions in the game, and they tend to take place in meticulously reconstructed versions of Washington's landmarks. At one point, for example, you must rescue the Declaration of Independence from the National Archive. The missions are long, multi-stage affairs that showcase the varied opposition offered by the different factions, who might rush you wearing suicide vests, or employ various technological aids that match your own. Beyond the missions, there are vast amounts of activities to pursue, including winning back control points, disrupting public executions, taking down propaganda broadcasts and clearing Strongholds (which are the game's equivalent of dungeon), sending waves of enemies at you. Still-contaminated Dark Zones, as seen in the first iteration of The Division, are back, providing player-versus-player (PvP) action with their own separate levelling-up. They reward you with the best loot, but have been effectively rethought for The Division 2, with everyone's stats undergoing normalisation, so they are less intimidating when you first enter them. And a new mode, Conflict, takes PvP out of the Dark Zones and onto Washington's streets. The Division 2 is huge and complex, but its complexity has logic behind it. It's a very meaty game - expect to spend 30 to 40 hours working your way through the story and up to the level 30 milestone, before the endgame kicks in. When that happens, there is one slightly annoying aspect: all your good work towards is disrupted by a new fearsome faction called the Black Tusk. But even that makes a form of sense, since it gives The Division 2 a compelling endgame - something its predecessor sorely lacked. Ubisoft has already set out an extensive roadmap of new elements it will add to The Division 2 to keep people playing it and as far as any existing games-as-a-service are concerned, it looks like it is in at least as good a position as any when it comes to sustaining interst indefinitely. Whatever your opinions on the merits or otherwise of games-as-a-service model that underpins The Division 2, it's tricky to find fault with it. It looks superb - its vision of a post-pandemic, extensively wrecked Washington is chillingly believable - and it's really absorbing and addictive to play. It certainly feels as though it has benefited from the sort of dress rehearsal for the genre that the first game offered, and it makes the likes of Anthem feel half-formed and lacking in depth. Whether such a complex game can grab the public imagination remains to be seen, but you have to respect Ubisoft for the impressive manner in which it has honed the franchise's vision.